Last Year: PREMIERS, 2nd with a 17-7 (+218) record and 38 points. Brett Finch is the biggest name acquisition, accepting a bench role over a possible starting spot elsewhere in the NRL to return to the Storm. 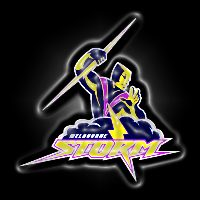 Junior Moors, Lagi Setu and Junior Sa'u have all joined the Storm as depth players, with no guarantee of a first grade spot - but their willingness to accept that role and embrace the chance when they get it, is the attitude Bellamy rewards at the Storm. And of course when it comes to the Storm - watch out for the next wave of young talent. Kirisome AUVA'A, Maurice BLAIR, Mahe FONUA, Mitchell GARBUTT, Tim GLASBY, Slade GRIFFIN, Benjamin HAMPTON, Jordan McLEAN, Junior MOORS, Junior SA'U, Lagi SETU, Young TONUMAIPEA, Siosaia VAVE. Dean BRITT, Kurt MANN, Matt McGAHAN, Denny SOLOMONA, Cade UMAGA. The Big 3 are fit and well but there's some concerns in the three-quarter line. Waqa is out with a wrist injury for a couple of months and Duffie's hamstring has him in doubt as well. With Blair also injured, there's a chance Sa'u gets a run, which would force O'Neill to the wing and Fonua holding his spot from the World Club Challenge. The other option is starting Finch at five-eighth and putting Widdop into the centres. Up front - Harris will start for Proctor, while Setu, Moors, Vave and Kenny Bromwich appear to be fighting it out for a couple of spots. MEL: Slater, Fonua, Chambers, O'Neill, Duffie, Widdop, Cronk, Bromwich, Smith, Norrie, Harris, Hoffman, Hinchcliffe. Bench: Finch, Vave, Ryles, Bromwich/Setu/Moors. Mahe Fonua looks like he'll get an extended run on the wing to start the season after a cup of coffee last year (though it was at the business end of the year), and Tohu Harris is a certainty to start the year in the top grade (and probably starting in the backrow). Kenny Bromwich is a real talent who should get a run off the bench sooner rather than later, while the club is big on Kirisome Auva'a, Ben Hampton, Matt McGahan and Young Tonumaipea. That is where the Storm's depth is in 2013 - backin their youth. Though there's a lot of options ahead of him on the hooking depth chart, keep an eye on Slade Griffin who has overcome a knee reconstruction that cost him all of last year. Another pickup in the off-season to note was former Newcastle utility back Kurt Mann. Round 1 at home - as premiers - against the Dragons at AAMI Park on Sunday afternoon at 3pm. There's no AFL regular season to compete with and Victorians love a winner - so if AAMI Park doesn't breach 20,000 then perhaps Melbourne isn't the sporting capital of Australia after all... Then the NRL gets a free ride on Thursday March 21 with the Grand Final replay against the Dogs in Round 3. Another cracker is later in the year during Origin when the Storm host the Broncos in Round 17 on July 5. They should be favourites for the Minor Premiership and the Premiership... and yes, they are. But not by the distance that their convincing Grand Final win suggests they should be... the squad isn't a great deal different and might have a little more raw talent than last year's group, and of course they've got Bellamy, Slater, Cronk and Smith. There's always a temptation to look at the depth on the Storm around those Big 3 and think - are they really that good without them? Well don't think in ifs or buts, look at the reality and that is with the Big 3 - Melbourne are simply the best. 1st | We gave the Tigers one last chance in 2012 to come good, picking them to beat the Storm in the GF though it pained us to do so. This year we don't make that mistake - take the Storm to win at whatever price you can get now - and double up on the Minor Premiership. They are the best in the competition until someone proves otherwise. Your Premiers for 2013 ladies and gentlemen - the Melbourne Storm go back to back. 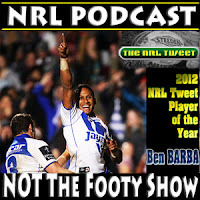 Can Cameron Smith, Billy Slater or Cooper Cronk take Ben Barba's mantle as the game's best player in the 2013 @NRLTweet Player of the Year Awards?